Jason Schwartzman makes obnoxiousness strangely appealing as the prickly title character of “Listen Up Philip,” an intelligently literate dramedy written and directed by Alex Ross Perry. The casually dismissive Philip Lewis Friedman is a dissatisfied-with-everything Brooklyn author whose second novel is about to be published in an indeterminate electric-typewriters-but-no-cell-phones era. Impatient and ill-tempered, he seems intent upon alienating nearly everyone in his personal and professional spheres, but is so entertaining about his empathy-free egomania that his absence is sorely felt whenever he isn’t onscreen. 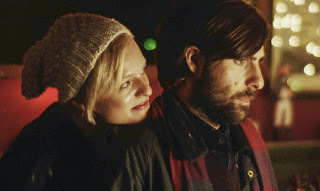 That presents a problem when the film shifts focus to segments devoted to Philip’s taken-for-granted live-in girlfriend Ashley Kane (“Mad Men”’s Elisabeth Moss), and the at first seemingly older-and-wiser writer Ike Zimmerman (Jonathan Pryce), whose country home Philip uses as an extended-stay retreat. Watching Ashley find her own identity and Ike fester in frustration provides tangential insights into how Philip has affected their lives, but it’s hard not wishing the story’s star would get back onstage ASAP. Supporting players include Krysten Ritter as Ike’s resented and resentful daughter Melanie, whose “I don’t find you charming” initial assessment of Philip fortunately does not progress in a predictable manner. Likewise, Joséphine de La Baume is Yvette, one of Philip’s fellow faculty members who is not quite the fantasy French girlfriend he has fantasized about since he was 14. Bibliophiles will want to stick around during the end credits to see the appealingly retro dustjacket images of several novels written by some of the movie’s characters. They are as stylized and yet convincing as their imaginary authors.